The following supporter opportunities are available for this exclusive golf event benefiting: The Law Enforcement Officers Relief Fund. This is an exciting opportunity to support an important cause, enjoy a beautiful golf course, and spend the day with friends, community supporters, and colleagues. All Levels Of Sponsorship Will Include: Players Guide/Recognition as Sponsor on L.E.O.R.F. Website & Facebook Page for 1 Year. Print/ Digital: 2019 L.E.O.R.F. Golf Classic Keepsake Journal- Ad (Up to 2 pages- 4/4- Included in Swag Bags at Registration & Mailed to Members)/ Logo Included on ALL Email Blasts for L.E.O.R.F. for 1 Year/ Mention of Sponsorship on Golf Radio Talk Show. Print/ Digital: 2019 L.E.O.R.F. Golf Classic Keepsake Journal- Ad (1 page- 4/4- Included in Swag Bags at Registration & Mailed to Members)/ Logo Included on ALL Email Blasts for L.E.O.R.F. for 1 Year. Print/ Digital: 2019 L.E.O.R.F. Golf Classic Keepsake Journal- Ad (1/2 page- 4/4- Included in Swag Bags at Registration & Mailed to Members). Print/ Digital: 2019 L.E.O.R.F. Golf Classic Keepsake Journal– Prominent Placement of Logo (Included in Swag Bags at Registration & Mailed to Members). Print/ Digital: Your Golf Balls will be Collected, Saved or Played! 2019 L.E.O.R.F. Golf Classic Keepsake Journal- Ad (1/2 page – 4/4- Included in Swag Bags at Registration/ Mailed to Members & Sponsors). Print/ Digital: Everyone Needs to Refill Their Golf Cart Coolers With Cold Beverages! 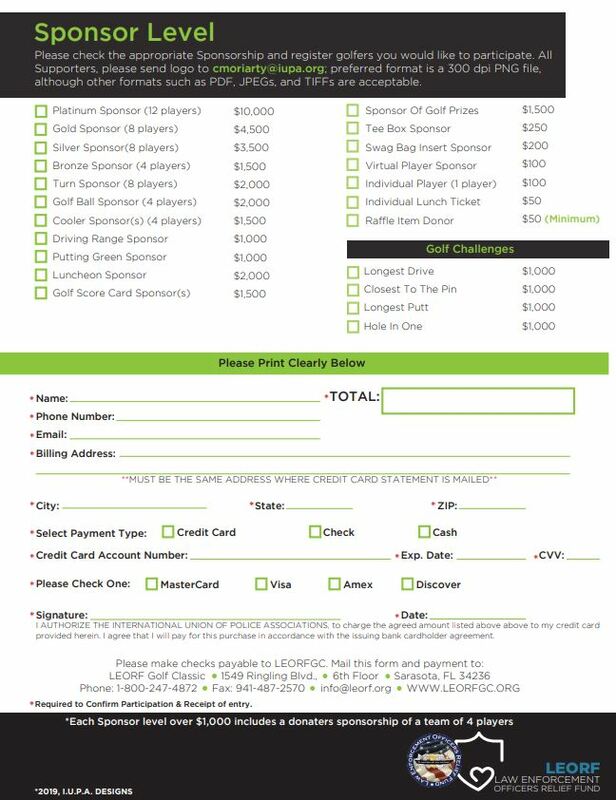 2019 L.E.O.R.F.Golf Classic Keepsake Journal– Ad (1/2 page- 4/4- Included in Swag Bags at Registration/ Mailed to Members & Sponsors). Print/ Digital: Everyone needs to WARM-UP & Stretch with the Big Club! 2019 L.E.O.R.F. Golf Classic Keepsake Journal- Ad (1/2 page- 4/4- Included in Swag Bags at Registration/ Mailed to Members & Sponsors). Print/ Digital: Everyone needs to practice 50% of their game! 2019 L.E.O.R.F. Golf Classic Keepsake Journal- Ad (1/2 page- 4/4- Included in Swag Bags at Registration/ Mailed to Members & Sponsors). Print/ Digital: Everyone shows up HERE! Lunch is brought to YOU by (Company Name Here)! 2019 L.E.O.R.F. Golf Classic Keepsake Journal- Ad (1 page (1), 1/2 page (2), 1/4 page (4) included in Swag Bags at Registration/Mailed to Members & Sponsors). Print/ Digital: Your Logo Will be Seen Throughout the Entire Event! 2019 L.E.O.R.F. Golf Classic Keepsake Journal– Ad (1/2 page to logos – 4/4- included in Swag Bags at Registration/ Mailed to Members & Sponsors). Print/ Digital: Your Logo Will be Seen Throughout the Entire Event! 2019 L.E.O.R.F. Golf Classic Keepsake Journal- Ad (1/2 page to logos- 4/4- Included in Swag Bags at Registration & Mailed to Members). Print/ Digital: 2019 L.E.O.R.F. Golf Classic Keepsake Journal- Logo (4/4- Included in Swag Bags at Registration/ Mailed to Members & Sponsors). Everyone Gets Ready for These Holes So, Let Them See Who is Sponsoring the Fun! Print/ Digital: 2019 L.E.O.R.F. Golf Classic Keepsake Journal- Ad (1/2 page to logos- 4/4- Included in Swag Bags at Registration & Mailed to Members). Please check the appropriate Sponsorship and register golfers you would like to participate. All Supporters, please send logo to [email protected]; preferred format is a 300 dpi PNG file, although other formats such as PDF, JPEGs, and TIFFs are acceptable. Check out the different opportunities to contribute! If you would like to submit an Ad, please fill out the Program Guide Form here. Donate an item to the raffle! We are looking for items to be raffled off during the Awards Luncheon.